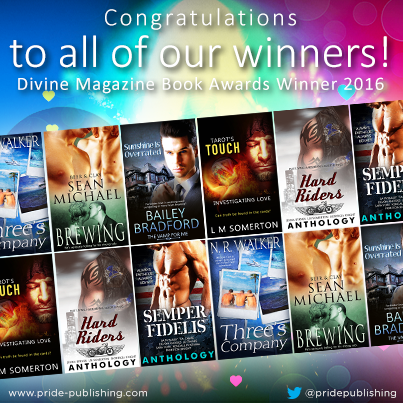 Congratulations to all Pride winners in the Divine Magazine Awards! Congratulations to these Pride authors on their success in the Divine Magazine Awards 2015! The 2015 Divine Magazine Awards were a great success as far as Pride is concerned! A host of our authors came in first, second and third place, dominating the results page. Divine Magazine is a hit blog for anyone interested in the LGBT arts, entertainment, culture, lifestyle advice and community. We've had the pleasure of working with Divine for a while now, so be sure to check out the site for plenty of Pride author spotlights and interviews. Congratulations everyone! Wishing all our authors the best of luck in 2016!